24 Seven Locksmith Toronto offers the leading and most affordable immediate Toronto locksmith services. Our team is available 24/7. Your local locksmith expert will arrive within 20 minutes. Click SEND and our representatives will get in touch with you right away. Need a new set of locks for every door? Your mom is locked out of the house? Our Toronto Residential Locksmiths Service provides wide range of security solutions for houses and apartments. Get an instant quote today. Lost your car keys? Car Lockout? Our certified technicians will be with you shortly to unlock your car without a hassle. Call Now at 647-325-7233. Our Locksmith Toronto is available 24/7 every single day, including weekends. You have an Emergency and you look for fastest solution. Our Toronto Locksmiths offer certified professionals 24 hours a day, 7 days a week. Just 20 minutes response for home, business or car Emergency. Toronto Locksmith provides business owners, shops and offices locksmith solutions. Get complete coverage for your businesses security needs with 24/7 locksmith support all year long. Call your local Toronto locksmiths now! Toronto Locksmith – Lowest Price Service Call. Fast Professional Response. Call For Free Quote Today. 24 Seven Toronto Locksmith offers locally trained and Professional Locksmith Technicians in the Toronto and the surrounding areas. Offering 24-hours a day, 7 days a week dedicated locksmith services. Look no further! You have found the best professional locksmith near you. Call us today and we are on the way to your location. We guarantee the Lowest price and top quality service, Less than 20 minute arrival In Your Area. 24Seven Locksmith Toronto can help you with anything from simple lock fitting and Emergency door opening to the installation of complete system for entrance door. We work with business and home clients in Toronto, 24 hours a day, 7 days a week. Open 24/7 in Toronto. Available Now Near You. Locked out in the office? Did your key break in the key knob? Looking for complete set of office locks replacement? Need a spare key to your store? Dial 647-325-7233 and let us provide you with a certified locksmith in Toronto. 24Seven Locksmiths provides Professional Keys and Locks service. Consult locksmith experts and get a free quote for your business. Car keys lost or stolen? Locked out from your car on the way to an important meeting? Need ignition repair? All types of car locksmith solutions are just one phone call away. Our service is available 24/7 all year long, on weekends an holidays for clients in Toronto area. Call us now at 647-325-7233 and our professional locksmiths will be at your location in less than 20 minutes. Our Toronto Locksmith services are certified and quality guaranteed. We deal with all kinds of car lock and keys problems with professional, fast and affordable solutions. Kids lost house keys? Forgot your keys in the car? Looking for instant Emergency assistance in Toronto area? Call 647-325-7233 and our Toronto local emergency locksmith will be with you in less than 20 minutes. 24/7 Toronto Emergency Locksmith service is at your service with quick and professional assistance at the time of emergency, no matter where you are in Toronto. Our pro locksmiths are certified to provide house locksmith, auto locksmith and business locksmith solutions, 24 hours a day, 7 days a week. Call us today and our Toronto mobile locksmith will be at your location within 20 minutes. Need to change the locks? Do you need a spare key? Are you locked out from your house? Dial 647-325-7233 for a free quote. Our trained local Toronto residential locksmiths will provide you with the professional outcome. Toronto Residential Locksmiths Services gives you fast and professional service at the lowest prices in Toronto area. We stand by quality, reputation and 100% customer satisfaction. Affordable Prices 24 Seven Toronto Locksmiths guarantees the low-cost price quote in Toronto area and surrounding. Call our certified technicians at 647-325-7233 for any locksmith services you need. Instant SOS Response Our Toronto Locksmiths are at your service day and night, 24/7. Insured, dedicated, certified professionals are at your location in less than 20 minutes. We offer reliable Toronto Locksmith service to residents, business owners and property managers throughout Toronto area and beyond. Our top priority is your satisfaction. Quality, dedication and professionalism guaranteed. Our Toronto Locksmiths have all the necessary training and lock and keys tools to provide locksmith solutions in any kind of situations, including emergency lockout, homes, businesses, vehicles and apartments. Call us for reputable, low cost locksmiths. 1 Number #1 Local Locksmiths in the Area 24Seven Locksmiths is based in Toronto and offers any kind of lock installation and repair service with outstanding, certified technicians. Our services focus on residential and commercial clients with 24-hour emergency lockout mobile assistance. 2 Emergency Call 20 Minutes Response Locked out in the house or apartment? The key got jammed? Need a rekey for the whole office? Car keys got stolen? Emergencies are always unexpected and happen at the wrong place, at the wrong time. If you have an lock or key emergency, you need Toronto locksmith services. Get instant response for all types of locksmith related emergencies with our 24 hr emergency locksmith solutions. 3 Certified Trained Technicians You cannot beat the quality. Our locksmiths are the best in Toronto. Fully trained with the latest techniques and updates in the industry, our technicians are prepared to deal with any request, emergency and project. 4 Great Price in Toronto Area Our certified staff offers most reliable and professional locksmith services in Toronto at the lowest cost in the area near you. Call us now for free quote at 647-325-7233. 5 Satisfaction Guaranteed We take every call seriously. Your satisfaction with the result is our top priority. 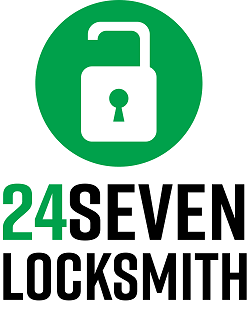 At 24Seven Toronto Locksmith, we stand by the most effective solutions to your lock-related security problems and projects. I was going though a nasty divorce and my ex changed the locks into our house without telling me first. I was locked out of my own home. Thank you for your quick response and rescue. With your help I was able to regain control of my life again. Recommended locksmiths in this area. Had dozens of lock-related problems in the house. My entrance door lock got jammed the other day and that was the last drop. I had to call the locksmith. I was surprised how fast the service van arrived and how quick all of my lock problems, including the front door issue were solved. The guy who came over to do the job was knowledgeable, very friendly and gave tones of advice on home security options. There are just so many overpriced locksmiths in Toronto, it is out of control. But these guys have reasonable prices and the work done is great. I would definitely recommend 24Seven Toronto Locksmiths. Flawless experience! Customer support gave free consultation on potential options for my lock issues in the office. Representatives are friendly, customer-oriented and quoted reasonable price for the job. The alarm system was installed as agreed in the discussed time frame. Very professional and honest service. I let my family and friends know about 24Seven Locksmiths in Toronto because they are superb. Keep up the good work! I needed to change my locks promptly because I recently fired a company which was remodeling my store. I called 24Seven Toronto Locksmiths quite late in the evening and requested an urgent assistance with the locks. I called sometime after 9 p.m. and honestly didn't expect to get an answer. The phone agent picked up and I had a locksmith tech at my location in half an hour. What a great service! The locks were changed really fast and I instantly felt safer. Thank you, 24 Seven! We are ready to take your call 24 hours a day, 7 days a week. Auto, Residence, Business, Emergency lock and key related solutions. Do not worry because you are in the right place. The best and the fastest Locksmiths service with lowest prices in all of Toronto area for emergency, commercial, auto and home needs at your local area 24/7.